Dr. Larry Stowell from Pace Turf has another video that I would like to share with you today. There is a new I-phone app. that allows you to use your phone as a stimpmeter to help determine the speed of greens. Interesting application. I'll keep my opinions regarding this tool to myself. Dr. Larry Stowell is located on the west coast and is a co-founder along with Dr. Wendy Gelernter of Pace Turf Information Service. They provide expert science based information to the turfgrass industry. They put together a video regarding the positive impacts that golf courses have on both the economy and the environment. I invite you to take a moment and watch the video. I was making a picture change to the cover of the blog and as you can see there is an issue with the layout. I'm researching the issue and hope to have a fix in the next day or two. Received our monthly update from the USGA Green Section and Bud White who is the director for the Mid-Continent region focusing on winter play and greens. Once snow cover has been removed from the course and the greens subsurface remains frozen, the course will be opened but once the thawing process begins, the course will be closed until the thaw has moved down at least a couple of inches into the profile to prevent root shearing and severe foot imprinting. Our January thaw is probably right around the corner and conditions will be monitored to reduce this potential damage. The average temperature for December was 3.6 degrees below normal. January is trending at least a couple of degrees below normal. The lower area of the Mid-Continent Region is in the coldest part of winter, and we are experiencing temperatures that call for attention. Superintendents must make sure that their bermudagrass greens are well hydrated during freeze/thaw cycles, especially under windy conditions that can quickly lead to desiccation. This is true for all dormant bermudagrass areas on the golf course – especially tees and mounds. As a rule of thumb, most superintendents cover their greens when temperatures are going to be about 28°F or lower overnight, especially if it is windy or if the following day and night are colder-than-normal. If the following day is going to be warm, say, above 50°, many superintendents do not even cover the greens at 28-29° or above. With bentgrass greens, playing on frosted, frozen, or partially-thawed greens is the biggest dilemma, and often the most heated argument! Golfers understand frost delays, but many believe that playing on frozen greens does no damage. To a large extent, this is simply not true unless the frost line is three to four inches deep and play is extremely light. Greens thawed in the upper ¼” to ½” are subject to the greatest degree of damage because, under traffic, the roots are sheared off at the frost line. Partially-thawed conditions usually occur when the weather is nice, and winter golfers are less tolerant of restrictions. Golfers, be assured that winter damage can occur on greens, and you must adhere to the advice of the golf course superintendent on these decisions for both the short- and long-term health of the greens. I spent the past 3 days attending the National Green Centre which is the Western Nursery and Landscape Association's annual trade show and education event at Americas Center in St. Louis. Knowledge of turf grass issues is my number one focus at Glen Echo but Horticulture/Landscape issues are also a part of our program which includes trees, shrubs, annuals and perennials. Saturday morning, I was privileged to attended a walk with Dr. Michael Dirr at the Missouri Botanical Garden. Dr. Dirr is one of the best resources in the world for horticulturists/landscapers regarding trees and woody shrubs. Dr. Dirr's 1000 page 'Manual of Wood Landscape Plants' has been used by me and many other professionals on many occasions in attempting to identify trees and shrubs on the proprieties that we manage. I've also used the manual to help determine the placement of a new tree or shrub with its proper cultural requirements. Dr. Dirr gave me some great information regarding potential tree species and cultivars to consider in the landscape for future plantings. Dr. Dirr was given the Henry Shaw Medal of Honor from the Missouri Botanical Garden this past spring. Also, a part of the program over Sunday and Monday was Dr. Allan Armitage who is one of the top educators in the country on the use of annuals and perennials. Click on the highlighted links for further information. Dr. Armitage's link is to his personal website which home gardeners would find very interesting to look at during the cold winter months. Photos of plants, gardens he has toured and links to his test garden in Athens, Georgia are great resources for home gardeners and professionals alike. Dr. Dirr(red jacket) standing in the MO Bot Ridgeway Center before our tour of the garden. Also on hand were June Hutson, Jim Cocos and Chip Tynan who are all long time staff members of the MoBot who are great resources for our area regarding all types of plant materials. Sorry, no pictures of the garden in the dead of winter which is actually very pretty. The battery ran out of charge for my camera. 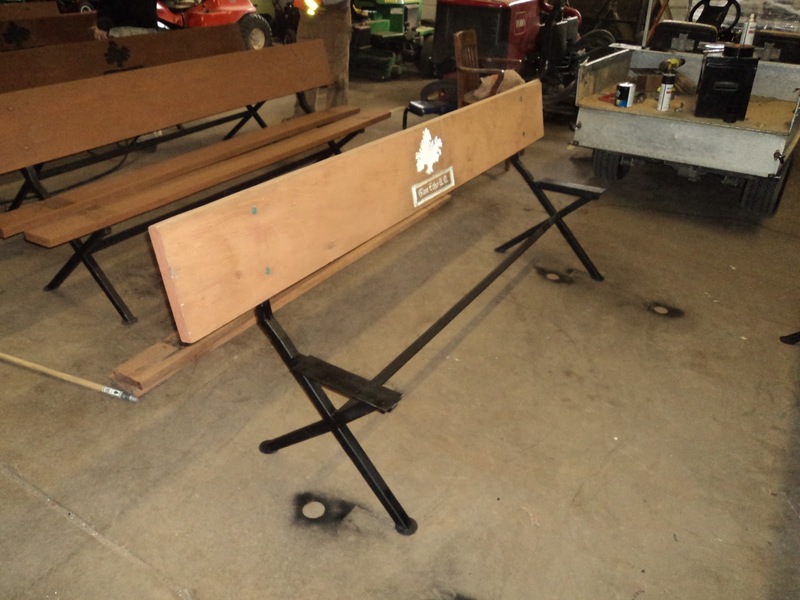 Each season our benches that are placed out on each hole are brought in for painting. A few weeks ago I described in an earlier post that the paint was being scraped away and another layer of green paint was going to be applied. The staff suggested that we strip the paint and stain the benches this season. I'm always willing for a little change so I told them to take care of it. 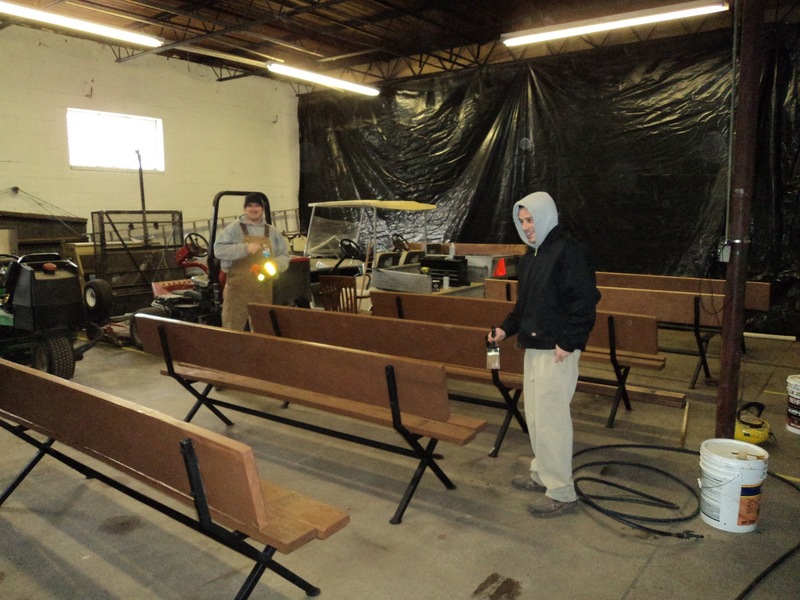 They stripped all the paint off of the benches, sanded the remaining material away and placed a nice coat of a sable colored semi-transparent stain and then placed a clear coat over the benches to help provide protection from moisture. I think the finished product looks great! 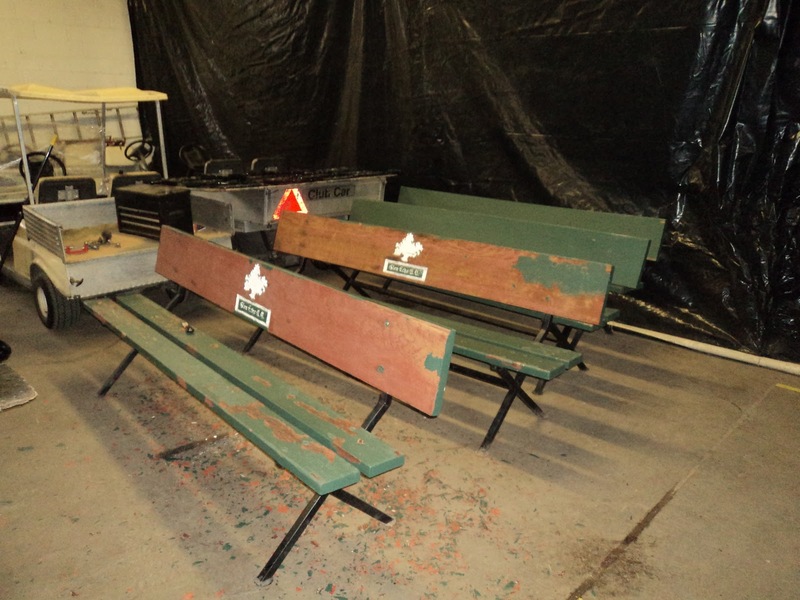 The benches from the initial chipping of the paint. 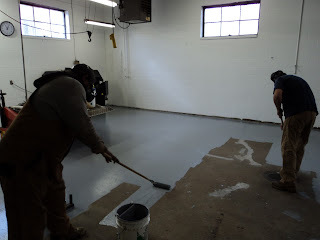 The guys then coated them with stripper and peeled away the paint. 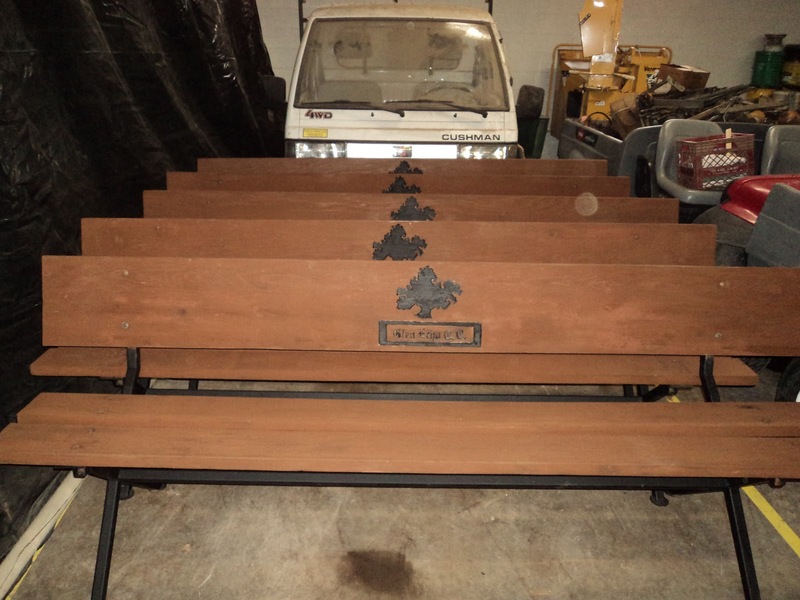 The benches were power sanded to remove the remaining paint and smooth the surface for staining. Tom and Jason putting the clear coat on the benches. Sitting boards were removed to get the paint off of the edges and to repaint the legs. 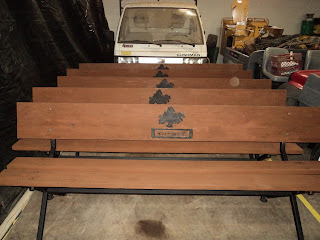 The seat back is in the sanded stage waiting for the stain. 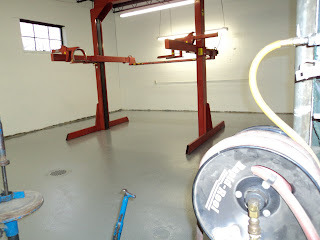 We were ready to paint the new floor early in the week delayed until today because the high fume content of the paint. This will give the weekend for it to dry out and help the fumes dissipate throughout the weekend. The staff had to do some major cleaning of the floor using a concrete cleaner. Skip and Harry spent the morning putting down the light gray epoxy paint on the floor. 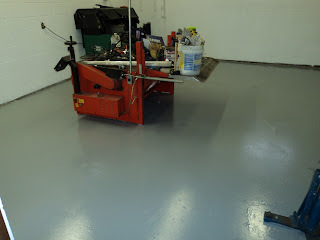 Should be dry enough after this weekend to start getting the shop put back together and the rest of our organizing completed. Mechanic Harry and Asst. Skip spreading on the epoxy paint. Using some breathing apparatus to reduce fumes, vapors which are very strong with this paint. 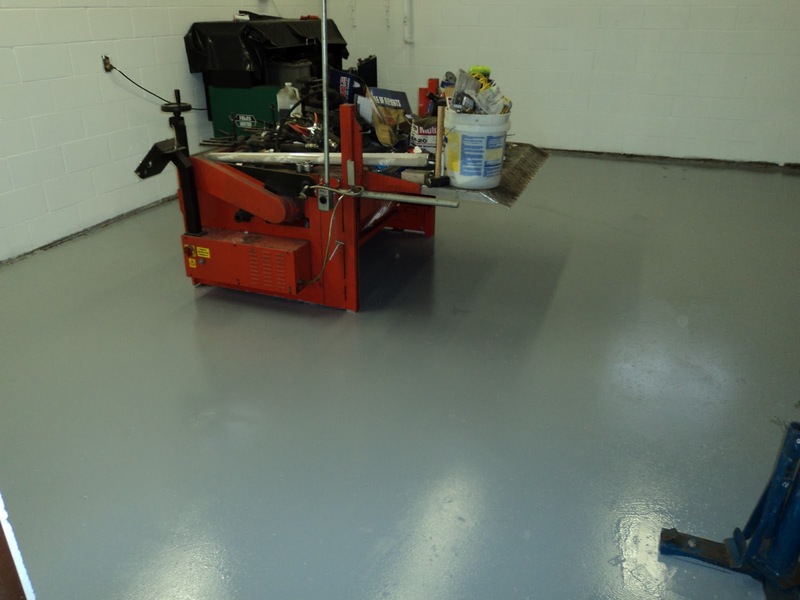 What a difference the new painted floor vs the old, dirty floor. The new floor looking toward the lift.